The 2018 San Francisco Section Daniel Cubicciotti Student Award Goes to Yuzhang Li! 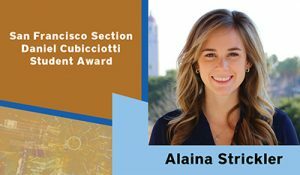 The ECS San Francisco Section, and a jury of representatives from Apple, Bosch, and QuantumScape have selected the 2017 winner and honorable mention recipients of the Daniel Cubicciotti Student Award. Each application was reviewed to select the candidates whose personal characteristics best reflected Dan Cubicciotti’s commitment to academic excellence, integrity, and ‘joie de vivre.’ Research judgment focused on the quality of the work, which necessarily had an electrochemical component, the broader context in which it had been performed, and the insight achieved to this point. Extracurricular activities were given equal consideration in the application judgment. 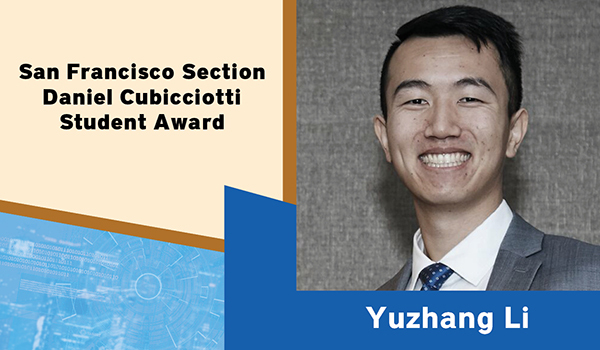 After a full review of all the candidates, Tianyu Liu (UC Santa Cruz) was selected as the 2017 Cubicciotti winner. Honorable mentions were Colin Burke (UC, Berkeley) and Limei Chen (UC Santa Cruz). Congratulations to all three of our recipients! Tianyu, Colin, and Limei will present their research at our Cubicciotti Award ceremony. Their abstracts and biographies can be found below.